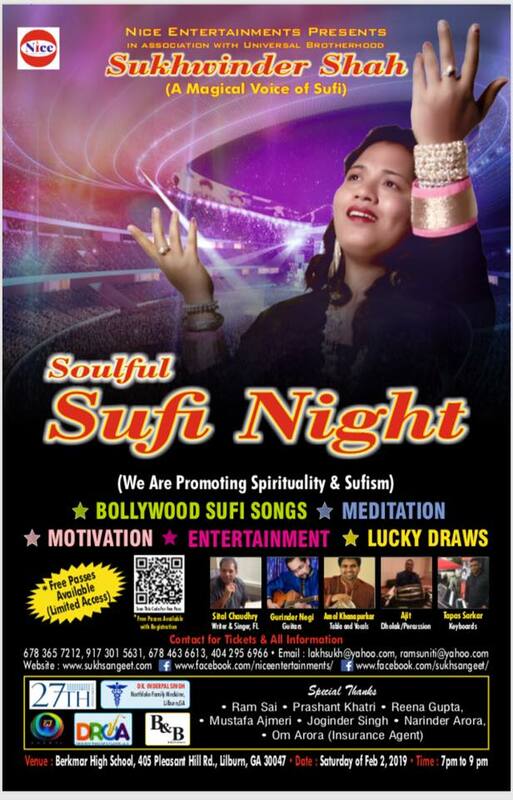 A Soulful Sufi Event is presented by "" Sukhvinder Shah"
Born and raised in Punjab into a music family, she was trained in Sufi Music since her childhood. Her qualification includes Master’s Degree in Vocal Music. Sukh started performing since her childhood. She has been participating in various cultural events and has won a lot of awards. Being the Sufi sensation she has been awarded with a Gold Medal for Punjabi Folk by Former Prime Minister of India Sh. Indra Kumar Gujral. By purchasing the ticket, you (“Ticket Holder”) agree to be bound by the Terms and Conditions of sale specified herein and any other provision as may be specified from time to time by Nice Entertainments. The Promoter / Venue Owner, their agents or employees shall not be liable for any death, personal injury (unless caused by negligence of The Promoter / Venue Owner or its agents and employees), loss damage however caused while in the venue nor are they liable for any complaints, claims, refunds, or exchange for any reason, including without limitation, cancellation or postponement of the event. Any refunds shall be made only at Promoter’s discretion. The Promoter / Venue Owner reserves the right, without refund or compensation, to refuse admission/evict any person(s) whose conduct is disorderly or inappropriate. The Promoter may add, withdraw or substitute artistes and/or vary advertised programmes, event times, seating arrangements, audience capacity without prior notice. The Promoter/Venue Owner may use the ticket holder’s image or likeness in any live or recorded video display, picture, publicity material or website. The Ticket Holder agrees to submit to any searches for prohibited items including but not limited to weapons, controlled, dangerous and illegal substances. The Ticket Holder voluntarily assumes all risks and danger incidental to the event whether occurring prior to, during or subsequent to the actual event, including any death, personal injury, loss, damage, or liability.